Featuring a 7 Amp, high-performance motor, this electric belt sander sands close to the edge of adjoining surfaces. A retractable hood exposes the sanding belt for a variety of applications. Dust collection with easy empty dust bag for a cleaner work area and ease of use. Low Profile Design extended reach for maximum functionality. 4 Inch x 36 Inch Belt & 6 Inch Disc Sander 4.3 Amp. Motor, adjustable/removable backstop, easy belt tracking system and belt tension lever for quick changing of sanding belt and handles all of your finishing operations including sanding, surfacing, grinding, cleaning and deburring on wood, metal and plastics. 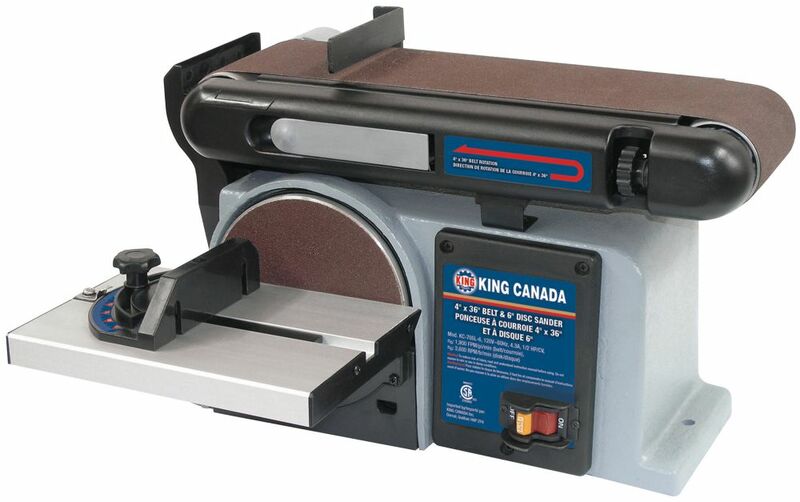 4 Inch x 36 Inch Belt & 6 Inch Disc Sander is rated 4.6 out of 5 by 5. Rated 5 out of 5 by BernieC from Awesome product Bought this unit as my older model succumb to many years (+20) of hard use making traditional birch snowshoes. The little improvements to tensioner and tracking adjust are excellent. Rated 4 out of 5 by Hey you from works great as expected Have not had a chance to use it a lot, but for the amount of time I have used it it works very well. Good sander. Rated 4 out of 5 by Spike from Great little sander Very good little sander. Paid for it self in the first two weeks of use. is the guard/stopper on the belt adjustable angle? Hello, thank you for contacting us. It is intended to be 90&deg; , so it is just slightly adjustable to be 90&deg;.